46 Responses to "Common Ground Cafe & Bakery @ The Razorback Inn"
Going again this Sunday with friends,have been there several times and cannot fault it. The food is beautiful the surroundings are great and the service is pleasant. Great food & atmosphere. On of my favourite places to eat ! Love eating here! The food is fantastic and the service is great. The place is very relaxed and the kids love it!! I have been coming here for a while and will continue to eat there. Yes I agree Carolyn,the green drink is brilliant. As is all the other foods that these wonderful people produce. Yes Lynda, I agree. The Pie is wonderful, The sambo’s are absolutely super too! My whole family goes to CGC in Razorback. It has beautiful scenery and atmosphere, a great welcoming environment and simple food that satisfies. My older sister introduced me to this place and that was a few years ago, the back garden is a must sit down place but all areas of the Inn itself and the surrounding grounds are fantastic. The dessert crumbles are a must to have to end a meal. The in-house breads are a great buy to take home. A great place to sit back relax, enjoy the day or night. I just love this place, so relaxing, food is fresh and beautifully served with lots on offer. Phenominal pumkin soup and simply beautiful to sit outside with nature while enjoying my food. A place where you can also feed your soul. Excellent, kind and courteous service, another reason I frequent this fabulous spot here on earth. The outlook superb also. I think I remember you did the catering at an Olympicas test event at Horsley Park in 1999. I remember you had a really great removable building and the food was lovely. Do you still do this type of catering? yes we still do this kind of catering with the same two-story wooden building. 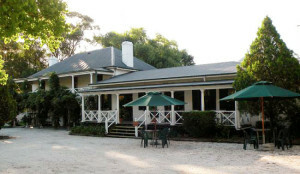 SOUL FOOD – not just the fantastic food and smoothies but the beautiful venue and surrounds. I love listening to the bellbirds while catching up with friends and eating a hearty lunch in the back garden there. Such a peaceful place to come to. I always leave feeling so content and happy (and with a couple of loaves of their wonderful gluten free bread!). We have been there now 5 times on monthly rides with friends on our motorcycles, and just absolutely love it. It’s so peaceful, with it’s beautiful surroundings, and the background music, and the food is fantastic. Will be there a lot more. I had the pleasure of dining here yesterday for the first time. The food was delicious, the atmosphere was relaxing and the service was friendly and attentive. Will definitely be coming back! my husband, brother in law, sister and I went Sunday for late lunch as usual loved the food and atmosphere, and we all always take food home with us. Our favourite is the not chocolate, which I could buy it to take home, my sister loved the warm cider with cream and agree with Amanda it was like drinking a apple pie .We are interested in going back on a Sunday night to try there wood fire pizza. Thanks common ground for great food. Lovely people! Every time I go, I get personal treatment! It’s so relaxing and friendly, I feel like melting away into the artisan woodwork and becoming part of the furniture. Absolutely amazingly relaxing atmosphere. The food was just delightful, the attentive staff so gentle and helpful. Our first but certainly not our last visit to the Common Ground Cafe & Bakery. We arrived for a late lunch on one of their busiest days of the year, Mother’s Day, and were reassured immediately that there would be a table found for our party of four. The Cranberry & Cashew Salad was delicious and I have to agree, the Warm Apple Cider just like an apple pie drink, I could have drank it as a dessert, just scrumptious. The kids, too, loved it and hubby’s Chicken & Leek pie was so yummy. Cannot wait to return to try another dish. Have also taken home some wonderful gluten free bread. A must to include as a relaxing Sunday drive and dine experience. Looking forward to Pizza on a Sunday in the future. Today we enjoyed a warm sunny morning coffee at the Common Ground Cafe and Bakery. Fantastic coffee, walnut banana bread and muffin. Then we purchased a loaf of sourdough, a fruit spelt loaf, jam and honey for later. People are relaxed, friendly and very attentive. Thanks for a wonderful morning. We had lunch there today, 19 May, and can’t speak highly enough of the ambience, the service and the food . We each had the Barramundi Burger – simply to die for! We will most certainly be back as soon as possible. I have been told about your amazing food (and coffee) and am wanting to organise a family get together out that way. A couple of our group have mobility issues and am wondering if there are any facilities available for someone on a walker and another in a wheelchair. yes we do have some lovely spots with wheelchair access, just give us a call on 46770600 to get some thing organized. Are you green bars gluten free? my mum recently bought some at Marickville markets, she said they are Devine but is unsure if they are completely gluten free. Hi the greenbars aren’t technically glutenfree as they have oats and barley malt, but some people do fine with them you just have to see. Could you please tell me when you will be resuming at the Bondi Junction Markets and what day. Are you still on holidays from the Christmas break. Hi Leonie, we have been back since the 8th and are there every thursday. Just wondering if you sell the greenbars at the bakery or do you only sell them at your market stalls. A friend of mine bought in bulk from you is that available? could you please tell me the ingredients in your green energy juice! Thank you and we love coming to your bakery!!!! Well this energizing drink is made from greens grown on our farm(Kale and Silverbeet) Yerba Mate(which is green energizing tea from Brazil) fresh juices(orange, apple and grapefruit) raw honey and linseed. We really enjoyed visiting the Cafe on sunday. The chicken and leek pie was the best I have ever tasted and my husband loved the macadamia cake with coffee. I love the green juice and bars and was pleased to be able to take a litre of the green drink home with me. I am hoping to be able to have a look round the farm on another visit. We stopped in on our way home from the South Coast. Kind service and nutritious food, warm ambiance. We loved the Barramundi Burger. My friends and I love the food you guys make! We have a question about the apple, rum & raisin bread – is there butter in those breads? Also what is in the rye fruit slice? There’s not butter in the Apple, Rum and Raisin. The Rye Fruit Slice is pretty simple – mostly the fruits and nuts, held together with rye flour, carob, date and grape molasses, honey, and barley malt. I’m not supposed to eat bread, i have just devoured a spelt loaf over three days. Farmed honey with olive spread, breaky each day instead of porridge.. No indigestion whatsoever. Spelt loaf was quite dense, sweet and covered with seeds. Smashing bread indeed. How many kinds of spelt loaf do you make? We have quite a range of spelt breads, including the plain wholemeal, sunflower & sesame, pumpkin, fruit loaf, and multigrain. What a Beautiful place to eat & relax staff are lovely food fantastic fresh homemade & soo tasty excellent customer service I’ve been twice can’t wait to visit again. Oh love the green bars ! Absolutely in love with this place …a great country drive escape from the city♥️regards Monica. great atmosphere for a lunch. the food is exceptional. its like having lunch with the Amish. Old style tables and furniture outdoor setting as well FANTASTIC! !